Voter registration, primary election turnout and early voting rates for the U.S. midterm elections have increased nationwide among America’s youngest eligible voters since the last midterm election season a promising sign for the Democratic Party, which polls have shown is favored by the nation’s youth. Hundreds of thousands of young voters have already cast their ballots. Early voting among 18- to 29-year-olds in North Carolina, Arizona and Georgia have all at least doubled in the 2018 midterm elections, compared with 2014, bringing in about 89,000, 71,000 and 115,000 votes, respectively, according to data analytics firm TargetSmart. In other battleground states such as Texas, the youth early voting rate has jumped nearly fivefold from the last midterm election, drawing about 332,000 votes. Interest in the midterms is up across the board as President Donald Trump casts the election as a referendum on his agenda and accomplishments. There’s also been a surge in first-time voters and young people of color, said Bonier, who partially attributes the increase in civic engagement to youth activism surrounding mass school shootings. Polling from Harvard University’s Institute of Politics and the Center for Information and Research on Civic Learning and Engagement (Circle) also indicate a heightened level of interest in voting among the nation’s youth. The young Americans still account for just a small fraction of early voters this year. 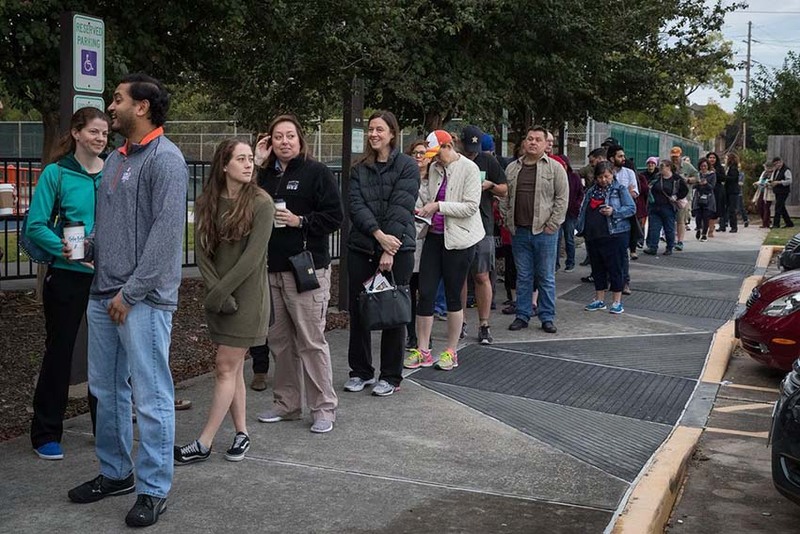 In North Carolina, Arizona, Georgia and Texas, the youth make up 7 percent, 6.9 percent, 8.5 percent and 9.4 percent of early voters, respectively, according to TargetSmart. Of course, such early votes account for just a sliver of the total that will be cast. The nation’s youngest eligible voters are most concerned about gun control, shows a new report from the American Psychological Association. Gun violence isn’t merely a political debating point for this demographic, said Arthur Evans, a psychologist and chief executive of the APA. Mass shootings have impacted youth on a personal level and caused them to become more civically and politically engaged, he said. With the midterm elections approaching, Gen Z reports feeling more stressed about political issues in the national news than other voting-age adults. “All my life, I’ve seen people who are my age, who look like me, getting shot on the news,” said Matt Deitsch, a 2016 graduate of Marjory Stoneman Douglas High School and senior strategist for March For Our Lives, an organization that mobilizes first-time voters in low-turnout districts and educates people about various forms of gun violence. March For Our Lives has hosted more than 100 events nationwide over the last nine months and registered an estimated 50,000 voters, according to an organization spokesperson. Young Americans who are actively involved in the gun-violence prevention movement are more likely to vote in the coming midterm elections than the demographic overall, shows CIRCLE. Some experts are skeptical. Young voters have historically disappointed at the polls, said Rob Richie, the executive director of FairVote, a nonpartisan organization that researches voter turnout. And even with increased turnout, they’ll still vote at lower rates than older Americans, he explained. In the 2014 midterm elections, which had historically low turnout, a mere 23 percent of eligible voters among the 18-34 demographic cast ballots, shows the U.S. Census Bureau. In contrast, 38 percent of those aged 35-44 voted, 50 percent of those aged 45-64 voted, and about 60 percent of those 65 and older voted. “Voting is less on their minds," Richie said of young Americans.